The Chinese delegation has noted that as mandated by WSIS, IGF has conducted productive and effective activities in promoting dialogue and exchange among the multi-stakeholders, and will conclude its mandate within its five-year life span. We would like to congratulate and appreciate the excellent work done by IGF Secretariat, MAG, and all the hosting countries including Greece, Brazil, India and Egypt. Meanwhile, we would like to point out some of the IGF shortcomings, as described following. First of all, the current IGF cannot solve in substance the issue of unilateral control of the critical internet resources. Secondly, the developing countries are lack of resources for participating in IGF meetings, and the priority of development agenda has been downplayed, which made IGF lacking of broad representation. Thirdly, the issues discussed in IGF have duplicated a lot with the work being explored and covered by other UN agencies and international organizations. Therefore, Chinese delegation think, without reform to the IGF as it is, it is not necessary to give the IGF a five-year extension. In the meantime, we noted that relevant parties, developing countries in particular, hope that internet governance issues could be discussed at the U.N. level. We support the views of Saudi Arabia and other developing countries in their proposal to set up the Enhanced Cooperation mechanism within the U.N. framework. In our view, if the mechanism of Enhanced Cooperation needs the extension of IGF for the purpose of exchanging views among multi-stakeholders, IGF should carry out reforms in the following ways. First, the future IGF should, in accordance with the provision of Tunis Agenda, focus on how to solve the issue of unilateral control of the critical Internet resources. Secondly, the representation and voices of the developing countries should be increased in the IGF, and the development issue should be placed as the first priority. Thirdly, we should seriously consider the possibility of incorporating IGF financing into the regular U.N. budget, and provide assistance to developing countries for their participation in the IGF meetings. Fourthly, we should follow rigidly the Tunis Agenda so that the reformed IGF should not duplicate the work and mandate of the other organizations. Fifthly, a Bureau should be set up with a balanced membership of various parties and geographical regions, and its term of reference and rules of procedures should be formulated by the United Nation. Sixthly, on tenure of the future IGF, we deem it necessary to review the extension of the IGF every two or three years. In the view of the Chinese delegation, the setting up of a mechanism for Enhanced Cooperation with a reformed IGF will effectively promote the global Internet governance process and facilitate the achievement of Millennium Development Goals. The Internet Governance Forum is winding down today in Sharm El Sheikh, Egypt. There have been a lot of very constructive conversations in workshops and panels over the past four days about how to advance security, privacy, child protection, AND human rights and free expression on the Internet. Unfortunately, the biggest headline coming out of the forum so far has been an incident on Sunday in which a poster promoting a book about censorship by the Open Net Initiative was removed by U.N. security. See reports by the BBC, the Associated Press, and the ONI's FAQ on the incident. Also see a YouTube video of the incident, and video of IGF Chairman Markus Kummer explaining the incident. Kummer said in his briefing that the UN has a "no-poster policy," although various other posters have in fact appeared at various times throughout the conference. One example here. According to those present during the ONI incident, the reason for the poster's removal given by U.N. security officials at the time was that a U.N. member state had complained about it. Given that the poster mentioned Chinese Internet censorship, we can guess which member state objected. The Chinese government made it clear earlier this year that they do not want the IGF to continue. Veteran IGF attendees have pointed out that there has been no Chinese-organized panel or workshop this year, in contrast to previous years. In conversations in the corridors with some participants from Western governments and other organizations, a number of people have expressed concern that China is feeling alienated. Nobody is sure what China's next move will be, and there is worry that the Chinese government may ally itself with some other governments in a move to end the IGF after its initial five-year mandate expires next year. China's system of censoring blogs and social networking services: Overseas services like Twitter, Facebook, YouTube, Flickr, Blogspot, and the like are blocked in China. As a result most people in China use social networks and blogging services run by domestic companies which are held liable for everything their users post on their services. These companies end up having to set up up entire departments of employees whose job it is to monitor and censor all user-generated content on their services. Foreign companies wanting to create localized versions are expected to do the same. MySpace is one company that ended up doing so, though many other companies - including Facebook - have opted for now not to set up censored versions of their services inside China, despite the fact that this denies them access to a large user base, because they are uncomfortable getting so deeply into the censorship game. South Korea's real-name registration system, which caused YouTube to disable video uploads and comments on YouTube Korea. Google was concerned that hosting such data domestically inside Korea might cause the company to violate the Global Network Initiative's principles on free expression and privacy, which Google has committed to uphold. Egyptian blogger and journalist Wael Abbas used YouTube to document human rights abuse and torture by the Egyptian police, and got his account suspended by YouTube administrators because they thought he had violated Terms of Service banning "gratuitous violence." Grassroots political activists in a range of countries from India to the United States have had their Facebook accounts suspended because Facebook's automated systems thought they were spammers. This afternoon (4pm local time, 9am EST, 9pm Beijing) I will be speaking on a plenary panel about social networks. I and the other panelists have been told very clearly by people in charge that we can't mention specific U.N. member countries, and we're discouraged from "naming and shaming" any other kinds of specific entities as well. It's going to be rather difficult to discuss emerging issues related to social networks without being able to give any specific examples of specific countries and companies. More broadly, it's rather difficult to make progress in global Internet governance without being able to discuss specific cases in the public meetings, or applying any value judgments to what any of the actors are doing. But that's the United Nations for you. Last night I considered whether it even made sense for me to remain on the panel. 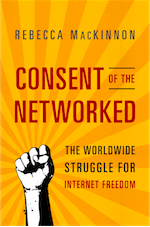 I decided to stay on it because I hope that I can get a message across - albeit generically - about free expression concerns on social networks, and how the Global Network Initiative is one way to help companies navigate these concerns. For what it's worth, live video of the session will be here. Twitter is blocked in China. Even so, a large and growing community of Chinese people are using it every day to trade news, ideas, and increasingly first-hand information about things that people are experiencing or witnessing. Several people have reported their detentions or "chats" with police live on Twitter. Others recently used Twitter to mobilize postcard-writing campaigns to get friends released from jail. If you want to keep abreast of the most interesting liberal-leaning social and political commentary on the Chinese Internet, Twitter is the most effective way. Since all of the Chinese domestically hosted social networking and blog-hosting services are heavily censored, China's liberal digerati have had to move outside the "great firewall" in order to have an un-censored real-time conversation with one another. For this reason it was not surprising that the official theme of the 5th Chinese Blogger Conference - held at the mouth of a cave in Lianzhou, Guangdong province - was "Micro Power, Broader World." The sessions ranged from the inspirational and theoretical to the very practical. Some veteran activists spoke overtly about using the Internet to push for civil rights and even political reform. Others focused on the personal - one popular travel blogger described how he shows Chinese readers how to travel to as many countries as possible on as little money as possible. His motto is: "The world will be different because I have lived." Several college students described how they use the Internet to run charitable efforts to help poor rural and migrant children. Zhou Shuguang (a.k.a. Zola) gave a tutorial on dozens of different ways to access Twitter. Another speaker gave a tutorial on how to be a citizen journalist. Tips included: Understand the basics of Internet and data security. Get a blackberry so that you can post live to Twitter. Be prepared in advance in the event you get in trouble. Know your legal rights and be confident when threatened that you're acting within your legal and constitutional rights. Make sure you have contact information of a few civil rights lawyers. Every single person has to bear one's responsibility and such sense of responsibility is micro power. The meaning of micro refers to every single Chinese citizen ... The meaning of power refers to action that brings change to the world. ..Every individual can take initiation where ever they want. This is how I understand micro power. Read Oiwan's whole post for more people's perspectives on "micro power" on the Chinese Internet. One participant who sat next to me on the bus back to Guangzhou told me he comes to these conferences every year to remind himself he's not alone. His co-workers and family don't have much interest in or sympathy for the CNBloggercon rhetoric. In fact they find it dangerous and subversive, despite the fact that nothing said or done at any of the CNBloggercon conferences I've attended has violated any Chinese laws in any way. But in China, simply making a point of exercising your constitutional rights can be a major feat. 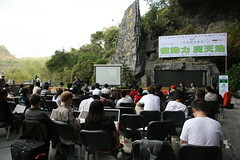 For the last four years the Chinese Blogger Cons were held in major cities. This year has been so politically sensitive - thanks to the 60th anniversary of the founding of the People's Republic, among other things - that organizers only announced the conference a few weeks in advance. The meeting itself was held in a tourist hiking area at the mouth of a cave in a place called Lianzhou - four hours north of Guangzhou - which many residents of Guangzhou have never even heard of. 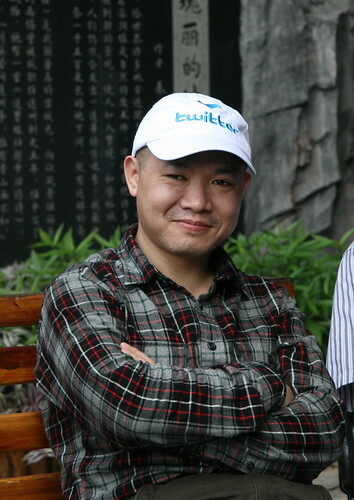 As blogger and citizen journalist Zhang Shihe (a.k.a. "Tiger Temple") put it, the CNBloggerCon community is engaged in an effort to "boil the frog in the reverse direction" - get the regime slowly used to functioning in an environment in which independent liberal voices are present and heard, without needing to freak out or fall apart. As Ran Yunfei (pictured at the top of this post) put it: "As we use the Internet every day, it changes us - It has made me more tolerant and taught me to play by a set of rules... As we train ourselves we are also training the government.. hopefully one day they will understand that they don't need to be afraid of us, that we can all legally and rationally coexist."